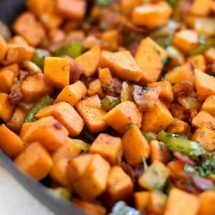 This Savory Sweet Potato and Bacon Hash is perfect for brunch and is a guaranteed crowd pleaser! Hey all! Sam back from The Culinary Compass. 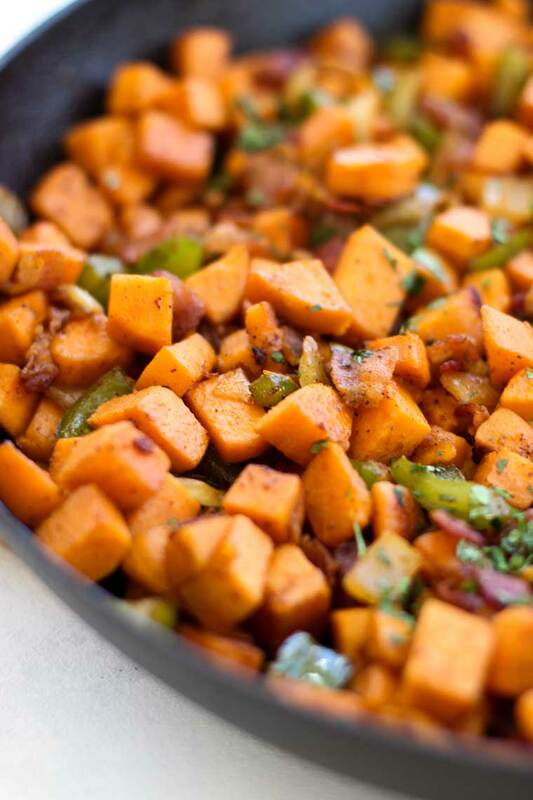 I’m excited to bring you this simple and savory Sweet Potato and Bacon Hash! It’s got a lot of bacon which is always delicious plus chili powder and garlic to give it a great savory and smoky flavor! You can definitely make this with regular potatoes too, but I prefer the sweet and savory sweet potatoes and how they compliment the bacon. Something about the two together makes it an addicting dish! The other great thing about this is how versatile it can be. 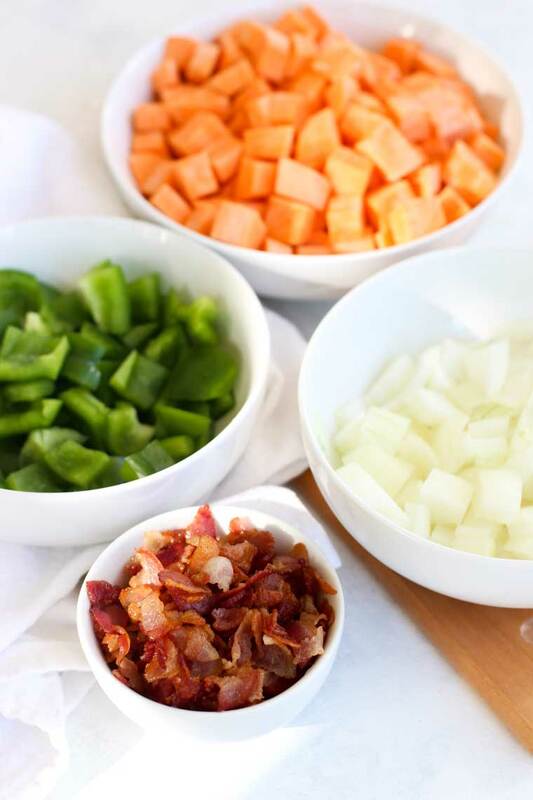 Try red onions or different peppers to make it your own. Black beans and corn plus some salsa could make this a great southwestern flavored hash too! 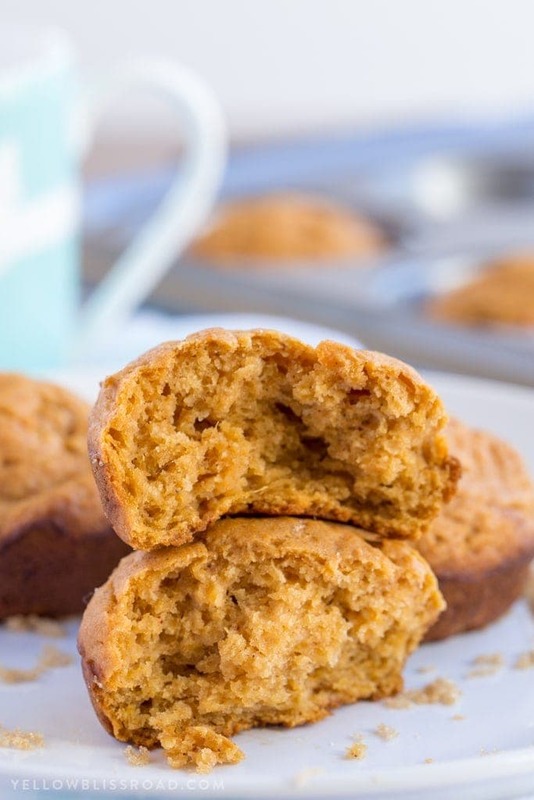 If you like really smoky flavors, try adding smoked paprika or a little cayenne for some extra heat! I’ll be honest and say this dish gets most of it’s flavor from the bacon grease. I never said it was healthy! You could always try turkey bacon and using coconut oil to cook the potatoes if you’re looking for a healthier alternative. 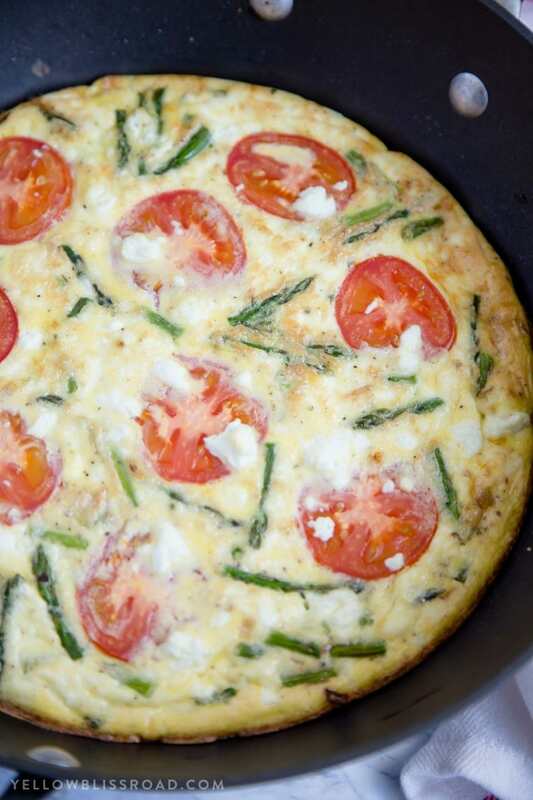 This dish can totally stand on it’s own for breakfast or even as a side dish for dinner. 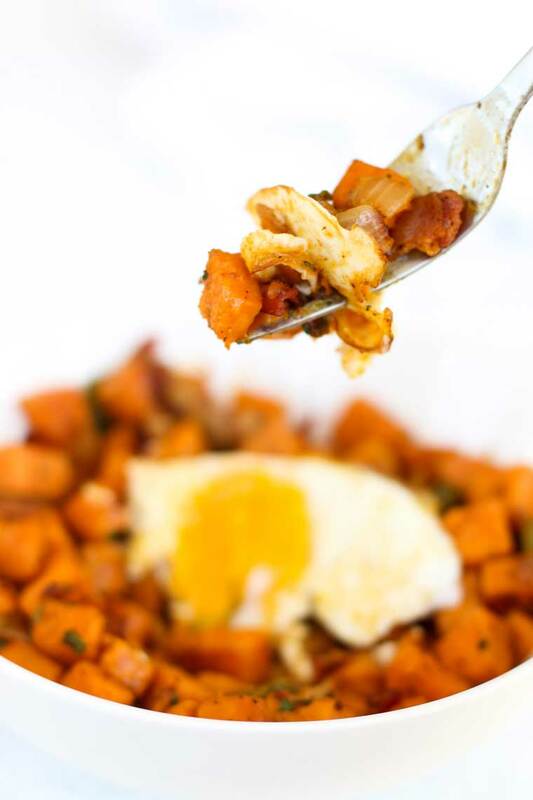 There’s just something about a sunny side egg on top of this hash that makes it almost sinful. There are few things that compare to a runny egg yolk with bacon and breakfast potatoes. If you’re looking for more brunch options, check out this Egg Bhurji or this 3 Ingredient Turkey Sausage Gravy! 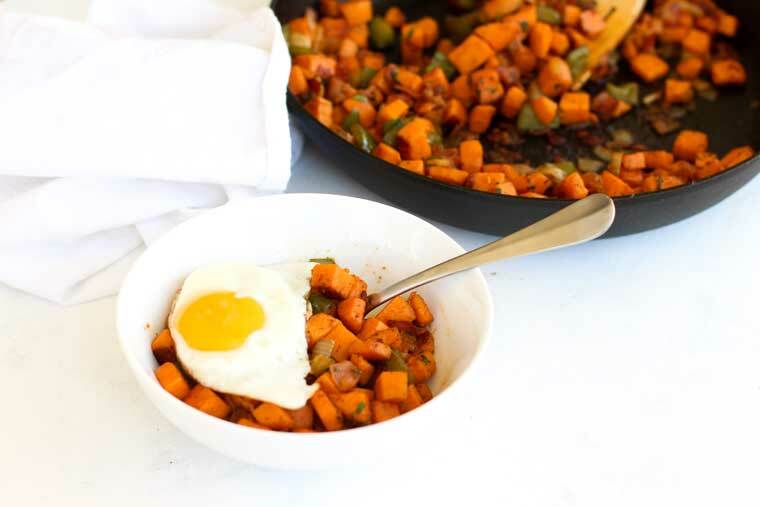 This Sweet Potato and Bacon Hash is an easy and savory brunch that the whole family will love! In a large skillet, cook bacon over medium heat until crispy, about 10 minutes. Remove with slotted spoon and set aside. Leaving bacon grease, add in garlic and cook 2-3 minutes. 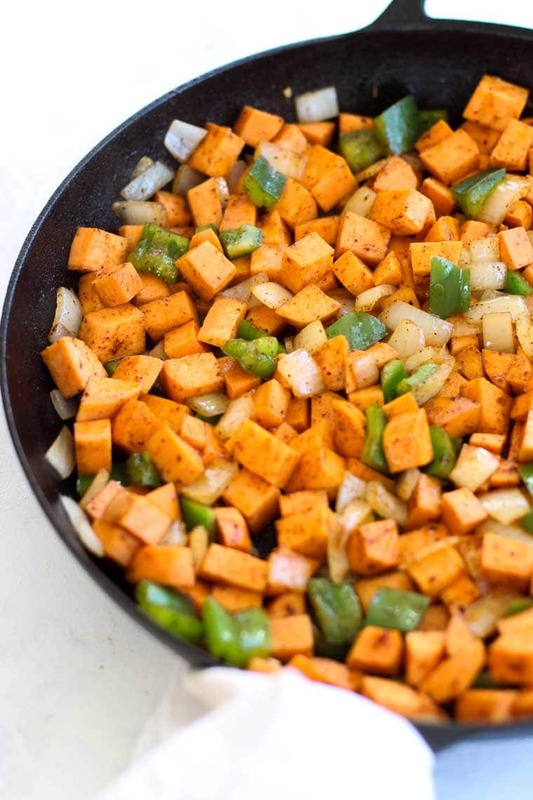 Add in onion, green pepper, and sweet potatoes. Mix together. Top with chili powder, salt and pepper. Mix thoroughly. Let cook over medium heat until potatoes are fork tender, about 18-20 minutes. Stir occasionally to ensure the bottom pieces don't burn. Add bacon back in and mix together. Serve warm and enjoy. Optional: Add a sunny side up or over easy egg to serve with! 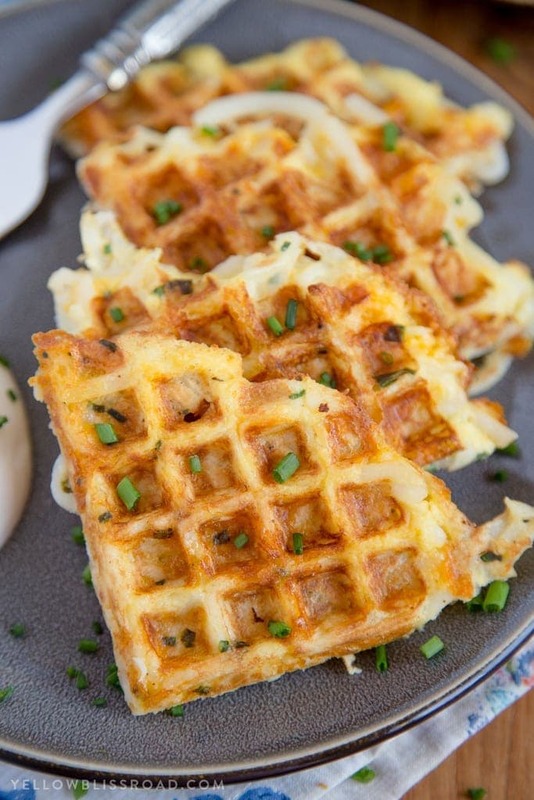 For all breakfast ideas go HERE and for the recipe index go HERE.